StoneBridge offers a vibrant lifestyle and wonderful amenities that encourages residents to engage in the community. 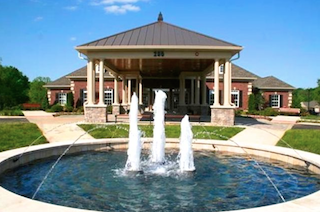 Open to residents of all ages, StoneBridge is a lovely Tennessee community which features homes that are sure to appeal to active adult homebuyers. In addition to its beautiful homes, StoneBridge offers a spacious clubhouse with an exciting line-up of amenities, as well as social activities which support an active adult lifestyle. Located in Lebanon, Tennessee, StoneBridge was opened in 2010 by Goodall Homes. Upon completion, the community will include approximately 800 residences in townhome, villa and single-family styles. Although StoneBridge is open to residents of all ages, its classes, clubs and activities are perfect for active adult retirees. StoneBridge's 8,000 square-foot clubhouse serves as the central hub of social and recreational activity. This lovely facility welcomes residents with a stylish lounge, a spacious cards and billiards room, and an outdoor patio with dining tables and a gas grill. There is also a fitness center where residents can stay in shape with cardiovascular and strength-training equipment. Outdoors, the amenities continue with a junior Olympic-sized swimming pool and surrounding sun deck. The grounds also feature over 140 acres of natural space, winding walking trails and a scenic pond. 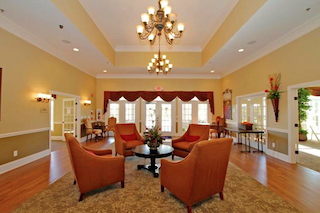 StoneBridge residents gather at the clubhouse great room to socialize or attend special community events. Beyond its clubhouse amenities, StoneBridge offers a number of clubs and classes, as well as an Activities Manager to help plan community events and activities. Special interest clubs and classes feature hobbies such as book discussion, couponing, gardening, sewing, walking and travel. The community also hosts holiday parties, potluck dinners, seminars and the Annual Meet your Neighbors Event. Built by Goodall Homes, the residences in StoneBridge often feature main-level living with open floor plans and first-floor master bedroom suites. Homebuyers who want low-maintenance living can choose from villa and townhome designs, which have exterior maintenance and lawn care included in their homeowners' association fees. Two-story townhomes are available in two floor plans: the 1,475 square-foot Edgewood model and the 1,545 square-foot Hamilton model. Each layout includes three bedrooms, two-and-a-half bathrooms and an attached one-car garage. The Hamilton model has a first-floor master bedroom suite, while all bedrooms in the Edgewood model are on the second floor. StoneBridge's villa homes offer main-level living, as well as the option of additional living space with second-story lofts. There are two villa floor plans, which can be personalized from 1,484 to 2,256 square feet. Each design offers two or three bedrooms, two or three bathrooms, and an attached two-car garage. Homebuyers who prefer detached living can also choose from one of StoneBridge's single-family homes. These spacious designs feature floor plans ranging from 1,868 to 2,941 square feet. They have three to five bedrooms, two to three bathrooms, and two- or three-car garages. All models feature first-floor master bedroom suites, except for the community's largest home, the Alexandria. Active adults looking for a friendly Tennessee community are sure to love StoneBridge's beautiful homes and diverse amenities.